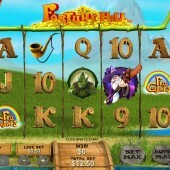 This is a strange little slot from renowned developer Playtech that appears to borrow from several texts including Lord of the Rings, Shrek and Peter Pan with the vast array of fictional characters that make a cameo on the reels. Fortune Hill is a 5-reel, 25-payline with a fairytale/ fantasy theme and yes, you are mistaken, that is not Gandalf waxing lyrical as the slot begins. That little Hobbit creature is not Frodo or Bilbo, either. I’m pretty sure the fairy isn’t Tinkerbell and the ogre isn’t Shrek himself, either. Familiar-looking fantasy characters aside, the first thing you will notice is the presence of a big water wheel next to the reels. This is the Fortune Wheel, and you need to make it your friend. There are sixteen spaces on the wheel with a number of them occupied by symbols. Each time you spin the reels, the spin finishes with the water wheel landing on a certain space. It is possible for you to trigger up to 4x multipliers, Extra Wilds, Frozen Reels, 3 re-spins, win up to 6x your line bet and earn a cash prize or Expanding Wilds on reels 2 and 4 depending on what symbol you land on. There are two other bonus features if the Fortune Wheel isn't enough to get your blood pumping and your fingers tingling. You don’t even have to kiss a princess or take a ring to Mordor in order to trigger them either. The Magic Mushrooms Bonus is triggered when you hit the magic mushroom Scatters on Reels 1 and 5 at the same time. You will be taken to a second screen where you are positioned on the edge of a cliff. On this cliff edge there are 12 magic mushrooms growing and you must pick from the selection of mushrooms to reveal a prize. Free spins fanatics should also fear not! There is a free spins bonus round. This is triggered when you hit three Free Games symbols on Reels 1, 3 and 5 simultaneously to award you with 8 free spins. During the free spins feature, the Fortune Wheel changes so that instead of the various prizes it offers in the base game, it will now just offer additional free spins where up to 8 spins can be triggered. I have to admit, when I first entered this slot I did chuckle at the lack of originality. It felt like Blueprint Gaming’s fairytale-themed Wish Upon a Jackpot just with less creativity. However, I did really playing this slot. The Fortune Wheel is a little touch of genius in the fact that you can trigger a feature on every spin. It would have been nice to see the characters on the reels have their own bonus features but maybe that’s an idea for a possible sequel? Not a bad slot altogether and definitely worth checking out.